How Much Resistance Should a Hot Water Heater Element Have? Troubleshooting an electric hot water heater can be simplified if you know just how much resistance the heater element should have. Understanding this value is a two-fold process and you must have some information to make an accurate measurement. 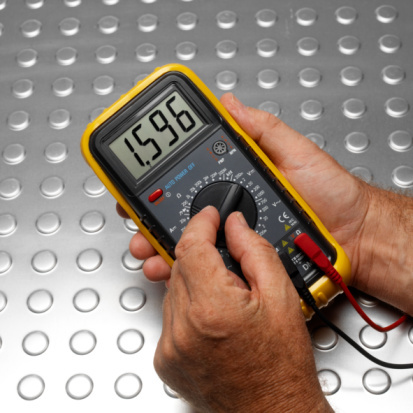 You must also use a volt ohmmeter to make the actual resistance measurement of the water heaters element. All water heater electrical elements are rated by the amount of power they can emit. This power is described as wattage or watts. Displayed on the elements packaging is a number followed by the word "watts". A typical value for a 220 VAC hot water heater would be an element rating of 3500 watts. An electrical formula is used to find the amount of amperage used by this size of heating element. The formula reads as watts are equal to volts times amperage (w = v x a). In order to find the amperage required for this element we divide 3500 watts by the 220 volts and the answer is 15.9 or 16 amps. The actual algebraically modified formula is (a = w/v). Resistance can then be calculated by using another basic electrical formula. This formula finds the resistance of any electrical circuit by having the actual voltage and amperage of that particular circuit. In this case we are looking for the resistance of the hot water heaters element. The formula reads that the voltage of the circuit is equal to the amperage times the resistance of that circuit (v = a x r). In order to find the resistance of the heater element from the above described section, we must algebraically modify the formula to read (r = v/a). Since we know that the hot water electrical circuit feeds 220 VAC to the 16 ampere heating element the resistance of that element is equal to 13.75 ohms. We can round that number up to 14 ohms. Remove all electrical power from the hot water heater. This may entail switching the circuit breaker "off" or removing fuses from the circuit. Use a screwdriver and remove the metal cover that protects the heating element from the outside environment. With the screw terminals exposed, disconnect both wires from the electrical heating element. Switch the volt ohmmeter to the ohms position. Insert the red lead into the "ohms" connector and the black lead into the "common" connector of the meter. Touch the two leads to one each of the screw terminals on the heating element. In other words, touch the red lead to one screw terminal and the black lead to the other screw terminal on the heating element. The ohmmeter should read in the vicinity of what was calculated or 14 ohms. The reading can be a little higher and a little lower. About plus 10 ohms or minus 5 ohms. Any meter reading that exceeds higher than 50 ohms over the calculated element resistance, indicates the element is going bad and will have to be replaced very soon.